You know, kids, Jack Clark didn’t used to be the rotund, angry guy bellowing about Albert Pujols and steroids, and suspicions and all of that stuff. He wasn’t the guy who got fired from talk radio for that. He didn’t used to be a sad guy who bankrupted himself buying all manner of sports cars, losing his home in the process. Jack Clark used to be a tight, sinewy, coiled cobra. An angry cobra, whipping his bat around like a snake’s tail, ready to swat baseballs great distances and with great anger. Jack Clark didn’t play baseball like a game, you never heard him say “Let’s Play Two,” or “The umpire doesn’t say ‘Work Ball. '” He was at his best when he played with a snarl. Jack Clark played baseball with a barely controlled fury, like was once said of Baltimore Colts’ linebacker Mike Curtis. Jack Clark’s rage playing baseball was like a part of his anatomy, like a muscle, he flexed it and built it up. And when the game was on the line, he was by far the most dangerous hitter at the plate, the one guy pitchers absolutely did not want to see on deck in the late innings. I imitated his swing, that twitching, coiling anticipation, that furious whip through the zone. He played for the San Francisco Giants then, and I envied Giants fans for having him on their side. Jack Clark had a rebel’s approach to the game. He would do things his way, and he wouldn’t let some “jive manager” tell him what to do. That’s what a Giants commercial famously parodied in 1984, when Jack Clark fought with manager Frank Robinson when the latter thought Jack Clark took too long to recover from an injury. Jack Clark complained about Candlestick Park, the coldest, windiest, nastiest outpost for a baseball game until a franchise is awarded to McMurdo Station in Antarctica. And yet playing there he still was the best clutch hitter in the game, the National League’s Eddie Murray, one writer said. I remember reading the Sporting News, back when the Sporting News was a real newspaper, not the load of crap it is now. Actually, that’s offensive, and I apologize. The Sporting News isn’t a load of crap, because at least a load of crap can be useful. But I digress. I remember reading about Jack Clark’s problems with the Giants, even as he put up amazing numbers. Jack Clark said he wanted out of San Francisco in the worst way. And one February day in 1985, he got it. He was traded to the team everyone had predicted to finished the upcoming season in last place, or below .500, anyway. 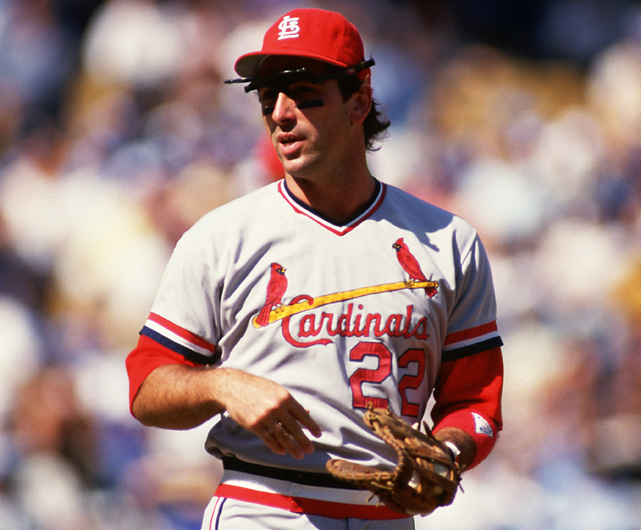 The Cardinals had just lost Bruce Sutter, their near Cy Young-award closer from 1984, who had saved 45 games, to a free agent contract from the Atlanta Braves. Cardinals fans had spent an agonizing year watching the Cubs go to the postseason for the first time since the troops came home from Germany and Japan, and with the loss of Sutter, well, it figured to be an even longer year. I’d practically shredded the Sporting News with excitement when I read the Cardinals had just traded a truckload of players to get Jack Clark. I didn’t care about the loss of Sutter, I figured Jack Clark’s addition would be exactly what the team needed, and that Cardinals fans are going to learn pretty quickly what I knew all along. And so we did. And in this clip from Sept. 22, 1985, the Montreal Expos got another lesson about Jack Clark. You don’t pitch to Jack Clark with the game on the line. Listen to the sound of the bat meeting the ball. It’s not a crack. It sounds like a gun shot. A gun shot with that Jack Clark snarl. It wasn’t just his 22nd home run of the year, matching his uniform number. It wasn’t just a home run that won them a crucial late-season game. It was what Jack Clark was to a team that needed a big lift after falling behind 6-1 in the early frames. The next home run in 1985 Jack Clark would hit put the Cardinals in the World Series. You’ve probably seen it. It was a clutch home run off the Dodgers. And it was an angry home run. Wrote Hummel: The rage in Clark almost was uncontrollable when he faced the Dodgers. “I tried to hit it out of the stadium. I didn’t just want a home run. I wanted to have it be shot out of a cannon,” he said. That was Jack Clark. He didn’t play baseball. He played baseball angry. This entry was posted in General Cardinals and tagged 1985, Jack Clark, Throwback Thursday by Michael. Bookmark the permalink. Jack Clark was my favorite player when I was growing up in SF. I still remember the day he was traded to the Cardinals. It was traumatic. One of the very best players in the 80s. Clark had it all when he first came up to the majors. Power, speed, played a mean center field, the desire to win and yes, anger. He was angry at his father who told him he would never be anything. Anger his father hated his Mexican-American high school sweetheart. Yet, Clark made himself into a feared clutch slugger. Still one cannot wonder what could have been.5 teams in 8 years. Battles with front offices and managers. If only he learned to just play ball.